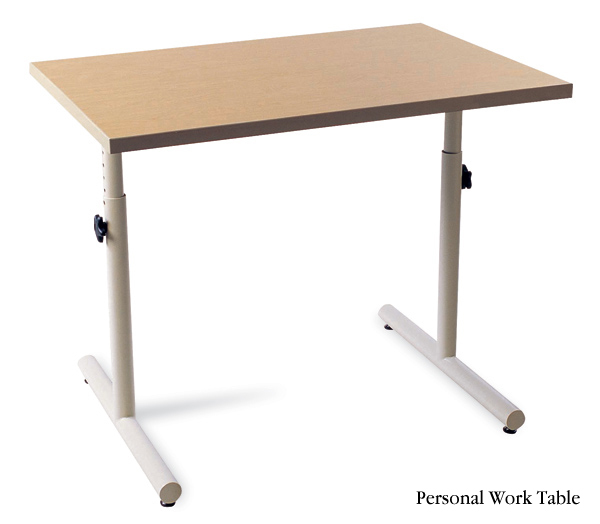 Functional and space-saving work table accommodates wheelchair users easily with height-adjustable legs. Laminate top facilitates therapy interaction between therapist and patient. Legs are designed to provide ample space to accommodate wheelchair users. Accommodates one patient and one therapist. Both models feature powder-coated steel legs with a height adjustment range of 23" to 33" (58 x 84cm). Height adjusts in 1" (2.5cm) increments by loosening and then re-tightening the oversized knobs on the legs. Durable, powder-coated steel base for years of use. Inner columns are galvanized to resist scratching. 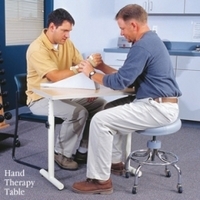 The Hand Therapy Table top measures 33" x 16" (84 x 41cm). The Personal Work Table top measures 36" x 30" (91 x 76cm). Shipping discounts do not apply.